As my family lived for many years in the Kumaun region this book has a social meaning to me. I have visited the same ashram where Groff did her research and possibly spoke to the same girls. Groff is able to paint a realistic picture of what is happening to the language ecology of the Kumauni language, which is probably not too different from several of the other Hindi related languages of India. The book is published as part of the “Palgrave Studies in Minority Languages and Communities” connected to the University of Bristol (UK). That seems to be a good fit! This book explores the linguistic ecology of the Kumaun region of Uttarakhand, India through the experiences and discourses of minority youth and their educators. 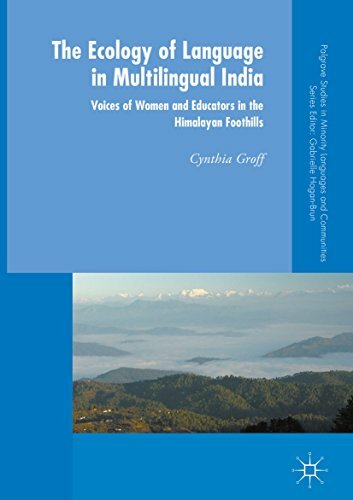 Providing in-depth examples of Indian multilingualism, this volume analyses how each language is valued in its own context; how national-level policies are appropriated and contested in local discourses; and how language and culture influence educational opportunities and identity negotiation for Kumauni young women. In doing so, the author examines how students and educators navigate a multilingual society with similarly diverse classroom practices. She simultaneously critiques the language and education system in modern India and highlights alternative perspectives on empowerment through the lens of a unique Gandhian educational context. This volume allows Kumauni women and their educators to take centre stage, and provides a thoughtful and nuanced insight into their minority language environment. This unique book is sure to appeal to students and scholars of multilingualism, sociolinguistics, language policy and minority languages. The book is available from Amazon India. As Dr Groff is part of this mailing list: Congratulations, Cynthia, for documenting this so well in this book!